(00:11) In previous sections, I’ve presented my thesis, framed the conversation, and told you my procedure for arriving at terminology and evaluating podcasts. In this section, I’ll put it all together and present the core of my argument: how the canons of arrangement and delivery are intertwined in the production of podcasts. (00:30) My claim is that there are two ways arrangement and delivery are intertwined. First, in the chronological process that a podcaster goes through in producing the podcast, and second in specific choices regarding narration, how much narration is used (or arranged) in the piece, and the vocal performance of delivery. ...and this process of arrangement occurs up until the very end until I hit render, with a few little tweaks. (01:20) But, the performative delivery of my voice, what we often think of as delivery in the classical sense, happens significantly before the final moments of arrangement. I deliver my voice (in many takes), and then put this all together on a visual display on my monitor, move it around, mess with settings, try to apply effects, regret it and delete them, and then arrange a final product. (01:48) And, all of that happens well after I have spoken the words and chosen the performance of my vocal delivery. So, in that sense my arrangement happens after my delivery and then translates into how the entire object is transmitted to you, the listener. This order of events bolsters Brooke’s (2009) theory of ecology, where canons are overlapping and connected. (02:10) Arrangement of the pieces also plays into what Quintilian (2005) calls the “manner” of delivery, or the manner in which we express things (p. 603). In classical rhetoric, this included both voice and action, like hand gestures, but since you can’t see me in an audio essay, the manner is implied in how I shift between my voice and others’ voices, the lengths of the takes that I use, the amount of pause or musical interlay in between, each of which is carefully arranged—but also becomes the manner of my delivery. (02:46) The second sense in which there is ecological interaction between arrangement and delivery is in the correlation of the terms I’ve chosen to guide my analysis: vocal presence and vocal engagement. Quick reminder: vocal presence refers to the amount a host is audible in an episode; vocal engagement refers to where the host’s vocal performance falls on a continuum between detached and enthusiastic. To see the patterns in the relationship between presence and engagement, I plotted my designations on the same graph with vocal presence as the x-axis and vocal engagement as the y-axis. That graph yielded some patterns, which I'm now going to work through with examples. (03:28) I’ll draw your attention to the webtext blue box, which includes the graph without groupings, and then again with the four groups indicated. The blue box also includes lists and short descriptions of how I’ve fit each podcast into the catagory it is in. After a quick description of the placement of podcasts on the graph, my audio will follow the groups in order from one to four, using one of the podcasts in each group as a representative of that group. This graph uses the placements of vocal presence as the x-axis and the placements of vocal engagement as the y-axis. Many of the podcasts are along the centerline of the graph, with most in the upper right quadrant. This recreates the graph above, but with 4 groups indicated. Group 1 contains podcasts with low vocal presence and low vocal engagement; Group 2 contains podcasts with high vocal presence and high vocal engagement; Group 3 contains podcasts with high vocal presence and high vocal engagement; Group 4 contains podcasts that are higher on vocal engagement than vocal presence. Love + Radio: Listeners hear host Nick van der Kolk at the beginning and end of episodes, as well as asking questions in the background, but he is mostly vocally hidden throughout with little explicit narration. He is also fairly detached in vocal performance of delivery. The Kitchen Sisters Present: The eponymous hosts are noticeably absent from the majority of their episodes; instead, the listener hears a story woven together from a multitude of songs, sounds, and other voices. When providing the context and reading the credits, the hosts use subdued voices that sound detached from the subject matter. Song Exploder: The show covers music, focusing on musicians who discuss the multiple elements of their compositions. Host Hriskikesh Hirway introduces and closes the show, but offers no commentary throughout. He is detached in delivery, not audibly endorsing music or artists with his voice. 99% Invisible: This podcast is one of the highest in both catagories. It covers “all the thought that goes into the things we don’t think about—the unnoticed architecture and design that shape our world” (Radiotopia, 2018), and their sound design in arrangement and delivery mirrors the attention to design signaled in the description. Mars guides us through each episode, with him or other producers providing commentary and signposts throughout, sharing their enthusiasm about the subject. These high numbers show how arrangement and delivery can overlap to feed one another, in the crafting of a show that has struck chords with a large audience, winning best podcast in 2016 (Webby Awards, 2016). The Allusionist: Host Helen Zaltzman is vocally present throughout each episode, introducing the episodes, often conducting an interview with an expert, and walking the listener through meanings and chronologies of words. Zaltzman is also fairly vocally engaged in her delivery, although she does take a more objective stance on language while admitting the fluidity of language. The Memory Palace: Unique among Radiotopia podcast hosts, Nate DiMeo hosts the entire show with no other voices or clips. He is on the upper end of vocal presence. He is also enthusiastic in delivery, describing events with a poetical flourish. The Heart: Focusing on love and emotions outside of the mainstream, including homosexual cowboys (“The Lost Pardner”) or trans-sexuality and age-play (“How to be a Princess”), the hosts Kaitlin and Mitra narrate most shows, but not all, sometimes having a dramatic retelling instead. Their voices are not objectively detached, but contain energy and some excitement. Strangers: Thau is vocally present throughout most of the stories by narrating and commenting on events. She has explained that she doesn’t see herself as a journalist. Instead, she becomes friends with many of the people she interviews (Rosental, 2014). Regarding vocal engagement, Thau is somewhat reserved, speaking evenly to and about her subjects, sharing personal details but not carrying overt emotion in her voice. Criminal: Host Phoebe Judge is present in interviews and contributes context throughout the episodes. However, unlike most of the other shows in Radiotopia that have a high level of vocal presence, she cultivates a more detached vocal delivery. Perhaps, in this case delivery is tied to invention; if she were too enthusiastic, it could be interpreted as an endorsement of crime or criminals. Mortified: A hybrid podcast where “adults share the embarrassing things they created as kids—diaries, letters, lyrics & beyond—in front of total strangers” (Radiotopia, 2018). The podcast consists of a person reading their childhood writing in front of an audience, and then an interview with a host. The host is present at the beginning and interviews the subject at the end, thus evaluated at the middle of vocal presence. But the tone of the show is lighthearted and all are vocally engaged throughout. Radio Diaries: Some of the episodes of this podcast are more heavily narrated than others and some have more enthusiastic vocal engagement from host Joe Richman. These balance out when listening across episodes, and thus I’ve placed Radio Diaries near the center of each category. This is the most centric of all shows charted. The Truth: Unlike the other podcasts in Radiotopia, The Truth features entirely fictive audio, described as “dramatic short stories that combine great writing with authentic-feeling performances and rich sound design” (Radiotopia, 2018). Host Johnathon Mitchell introduces a story and reads the credits afterward, but does not participate in the drama. He is more enthusiastic than detached, but falls in the midrange when compared to the other Radiotopia hosts. (03:58) This graph is my primary evidence for my argument that choices made about vocal presence can indicate, influence, or at least correlate with choices made about vocal engagement. 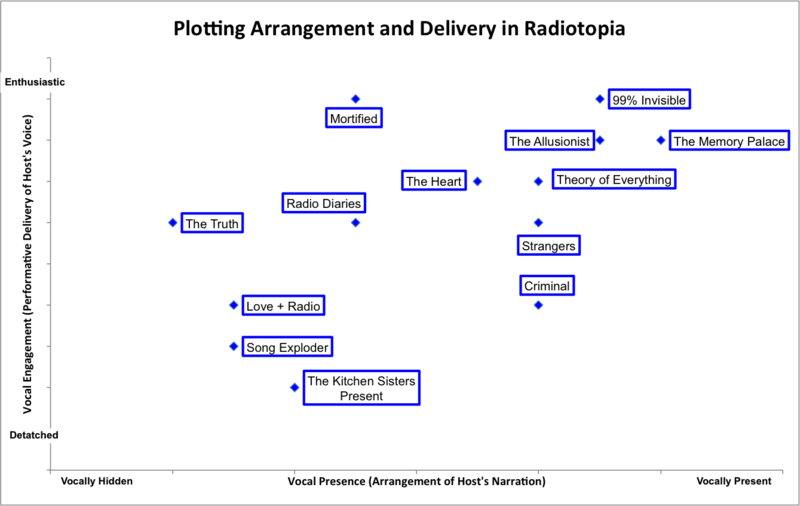 Most podcasts in Radiotopia are near the centerline, showing equivalent vocal presence and vocal engagement. Second, there are four evident clusters, which I'll examine in a moment. Third, there are two categories that are unpopulated by podcasts, where no podcasts fall. I’ll examine the implications of that after I discuss the podcast clusters. (04:40) One of the clear groupings—once I plotted my designations of vocal presence and vocal engagement on the same graph—was in the quadrant that designated low presence and low engagement. Three central podcasts met this designation: Love + Radio, The Kitchen Sisters Present, and Song Exploder. (05:50) This is one of the few pieces of vocal presence from Hirway; much of the episode is focused on exploding the theme from Game of Thrones, isolating parts of it and having the composer narrate the why, how and what of the song with the host present at the beginning and the end, but not in the middle of the podcast. (06:15) Another significant grouping in the graph of presence and engagement is the opposite of the last: high vocal presence and high vocal engagement. This is the largest group and includes 99% Invisible, The Allusionist, The Memory Palace, and The Heart. Each of these podcasts includes both a high number of signposts and guidance from the host, as well as a high level of vocal enthusiasm for the subject or the topic. (07:26) This podcast is fully narrated by diMeo without clips from others, scoring it the highest possible score on vocal presence because he is always vocally present. diMeo also works to be vocally engaged, talking about how interesting these developments are in the grand scheme of history. (07:49) A smaller, but interesting, group of podcasts is those that have a high level of vocal presence but a lower level of vocal engagement. These hosts are present throughout the podcast, but work to sound more detached or objective about their subjects. This group includes Strangers and Criminal. (08:09) I'm going to use an example from Criminal here, which I evaluated as high on vocal presence but lower on vocal engagement. This is from the May 15th, 2015 episode “Gill from London” about an internet-romance scam. Judge: What was that like, sitting there alone, listening to it? Karen: I was mad. I was very angry. Very angry, that, this had happened to me. Because I like to think I’m smarter than that. Judge: Yeah, you kinda feel like a fool, huh? Karen: Right, yeah, I felt like a fool. Judge: So Gill, or the man calling himself Gill, wasn’t an older British man. He’d lied about that. He didn’t seem to be in love with Karen, or really know all that much about her. So, maybe a romance scam. But he never asked Karen for any money. Or anything like it. So what did he want? We decided to call him and ask. Judge: Hello. I’m looking for Gill. (09:13) Host Pheobe Judge is vocally present through the episode, guiding interviews and linking pieces together. But, while I evaluated Criminal high for presence, because she often intersperses her voice, I evaluated it lower on vocal engagement. Here is another clip from earlier in the episode. (09:59) While Judge certainly sounds interested in the story she is telling, she's not openly enthusiastic about it, instead using her voice as more of an objective guide to what happened and why it matters. (10:14) I should make it clear that scoring low on either of these spectrums is not an indicator of dislike, or a failing of any sort. These are rhetorical choices that are successful. They are just different rhetorical choices than other podcasters have made. This is possibly tied to invention to what the story is about as well. But, what the story is about is also signaled in the voice, so that becomes an issue of performative delivery. (10:51) The final group present in Radiotopia is where the hosts are vocally engaged but not particularly vocally present. This group contains three podcasts: Mortified, Radio Diaries, and The Truth. Two of these are somewhat special. Mortified consists of recordings from a live show where a contributor, not a host, reads a portion of embarrassing writing they did when younger to an audience. This is often a diary, and it's very funny. This is humorous podcast, and the host serves to deliver an interview at the conclusion of the podcast, add some context, ask some questions, but the host is vocally hidden throughout much of each episode. The Truth is a radio drama podcast featuring fictional stories. The host, often enthusiastic in some way about the story, introduces it and reads the credits, but it is not present during the story itself. (12:25) And next an example from the interview portion at the close of the show, where the host, in this episode Dave Nadleberg, interviews Jordan. Nadleberg: We caught up with Jordan recently where he told us that as a twelve year old he spent nearly four months writing “Crouching Raptor—Hidden Tourist” and still failed to finish a first draft. Jordan: You know, you the do the whole like “Hey, what did you do over summer break?” and somebody might have gone to Oklahoma to go visit their grandmother, or somebody might have gone to, um, I don't know, they joined Boy Scouts or something, and I had composed a 108-page script for fun. (13:16) While Dave Nadleberg is engaged, vocally, in the episode, he is absent for much of it. Excluding the preliminary announcements, Nadleberg is only present for about 18% of that episode. (13:32) The final two groups I want to discuss are the ones that don’t exist. There are no podcasts in Radiotopia where the hosts are vocally hidden but highly engaged. That is to say, no host opens a show with open enthusiasm but does not narrate the show. So nobody’s coming in saying “Hey ya’ll, let’s talk about something” and then you don’t hear from them until the end when they say “that was cool, that made me think about something else.” No one does that. 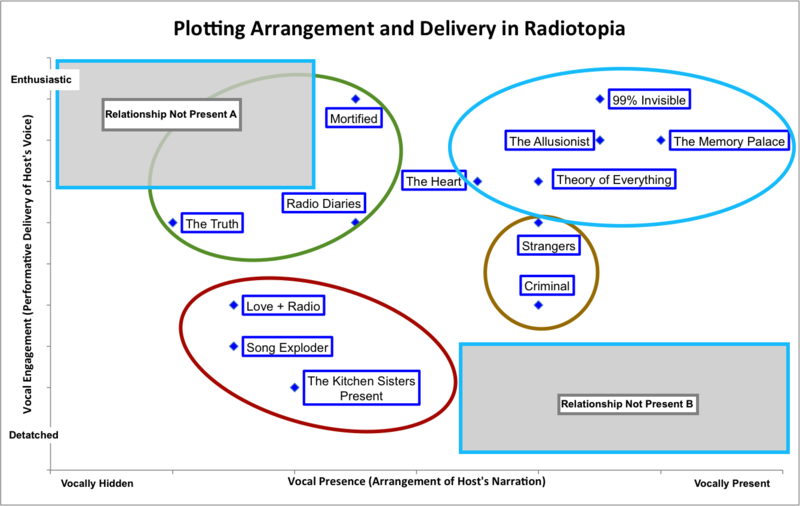 This graph indicates the relationships that are not present in Radiotopia. Relationship Not Present A indicates where a podcast would fall if it was highly enthusiastic but vocally hidden; Relationship Not Present B indicates where a podcast would fall if it was highly vocally present but wholly detatched in vocal performance. (13:59) Also, none of the podcasts have high vocal presence with low vocal engagement. None of the hosts narrate long portions of an episode, but with detached voices. If a host is going to speak a great deal, they are going to be more enthusiastic about the story they’re telling. 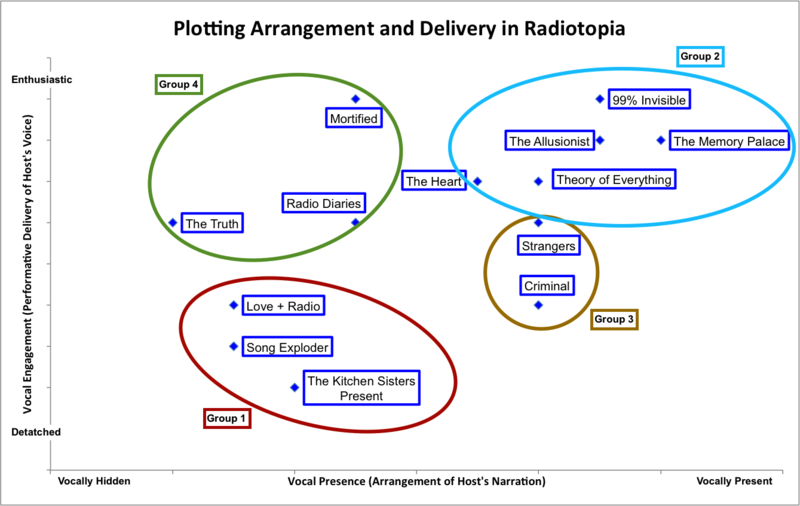 (14:14) The results of analyzing Radiotopia for vocal presence and vocal engagement show a relationship between arrangement and delivery in podcast production. If a podcaster is enthusiastic, then it is likely he/she/or they will use their own voice more. If a podcaster wants to sound more detached, then it is likely he/she/or they will but the subjects forward more. (14:43) All of the shows in Radiotopia are successful and quality podcasts; these criteria are not presented as evaluative. Different audiences might enjoy one type over another while still admitting that all the podcasters in Radiotopia do good work. That means that these different groups of arrangement and delivery, or vocal presence and vocal engagement, are successful rhetorical choices. (15:08) The various correlations between presence and engagement are evidence for an ecological relationship between the canons of arrangement and delivery. Choices in one canon fit with, influence, or predict choices in another canon. While we can isolate aspects that map on to specific canons like arrangement and delivery, those are not entirely fixed or stable, following Brooke’s (2009) claims in Lingua Fracta, but here uncovered in the medium of sound, one that Brooke doesn’t cover. Bundle this with the first point I made about chronological order of composition in performative delivery, and you have two intertwined canons, which are also connected to invention and style, ecologically. (15:54) I hope I’ve proven to you, or at least opened your mind to the idea that arrangement and delivery overlap in podcasting. The next section will cover the implications and further questions from this argument. Thanks for listening; please click onward for the conclusion of this piece in the Outro section. Goodbye for now.